Stunning vistas. Snow-capped mountains. Shimmering lakes. Majestic horses roaming free and wild. This is Carson Valley, Nevada: a totally underrated and overlooked region in northwestern Nevada. Carson Valley sits just east of South Lake Tahoe, nestled between the Eastern Sierra and the Great Basin. It’s the meeting point of the high alpine and the high desert, surrounded by rugged peaks. And it’s an incredible destination for outdoor adventure lovers and hikers. Carson Valley is a quick day trip from Reno or Lake Tahoe and a fantastic weekend trip from the Bay Area. The area includes the towns of Minden, Genoa, Gardnerville, as well as beautiful Topaz Lake. But if you’ve never heard of any of those, don’t worry: you’re about to find out why Carson Valley, Nevada is a must-visit destination for adventure junkies and nature lovers alike. 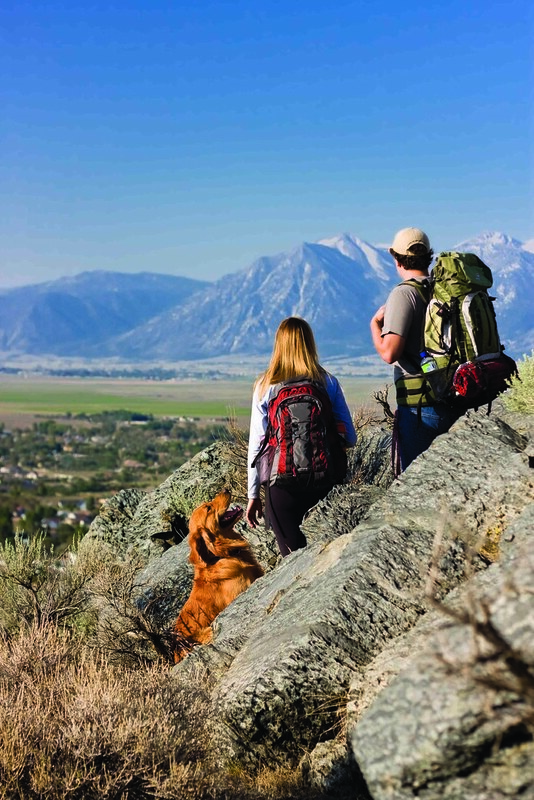 From adrenaline pumping outdoor adventures to hiking to wildlife spotting to camping, Carson Valley has everything to offer for adventure travelers and lovers of the outdoors! Here’s what you’ll find in our outdoor adventure travel guide to Carson Valley, Nevada. 4. Take a Wildlife Photography Tour & See Nevada's Wild Horses! A quick note on the whole adventure thing. Between the two of us, we’re split between loving high-octane adrenaline pumping adventure sports (Jeremy) and preferring more calm, relaxing outdoor activities (Lia). Ever since that minor incident with the waterfall and the panic attack and the rescue in San Gil, Colombia, Lia’s put her foot down on trying out new exciting fun scary things. But we’re both obsessed with the outdoors and lovers of all things adventurous. So, we each picked a few outdoor activities in Carson Valley to represent both of our preferences. There’s a pretty even split in this list between stuff that makes you go “AHH!” and stuff that makes you go, “ahhh,” if you get my drift. There’s a little something for everyone in Carson Valley, Nevada, y’all! Ok – let’s jump in. Bring a tent – or a hammock, if you’re us – and go camping in the granite cliffs and pine forests near South Lake Tahoe and Carson Valley, Nevada! As with most adventure towns and outdoor activity destinations, Carson Valley has several fantastic opportunities for camping! (We love glamping, but there’s a time and a place.) Set up your tent, hammock, or RV in a campsite next to Topaz Lake and jump in. Or how about camping on the shores of Lake Tahoe at Zephyr Cove Resort? If hot springs and pools are more your speed than lakes, head to Grover Hot Springs State Park, where you can you relax in a swimming pool or a natural hot spring in the shade of sweeping granite mountain vistas. With campsites and 3 excellent hiking trails, you can visit Grover Hot Springs State park and soak in its warm waters year-round. Hot springs in the snow!? What is this, Iceland? Awesome! The varied terrain in Carson Valley – from mountains to high desert and everything in between – allows for some incredible opportunities for mountain biking. Take a ride on the Pine Nut Trail in Gardnerville or the Genoa Loop in Genoa, perfect for beginner or intermediate riders. If you’re a more advanced mountain biker, give the Sierra Canyon Trail a try. Don’t have a mountain bike handy? Don’t worry, you can rent one in South Lake Tahoe. Channel your inner cowboy as you straddle a horse and ride off into the sunset to live your very own Brokeback Mountain fantasy. Wait, what? No, this is a lot more PG than that. But you’ll be on a horse, and there will be mountains, and you can pretend to be a cowboy if you want, I guess. 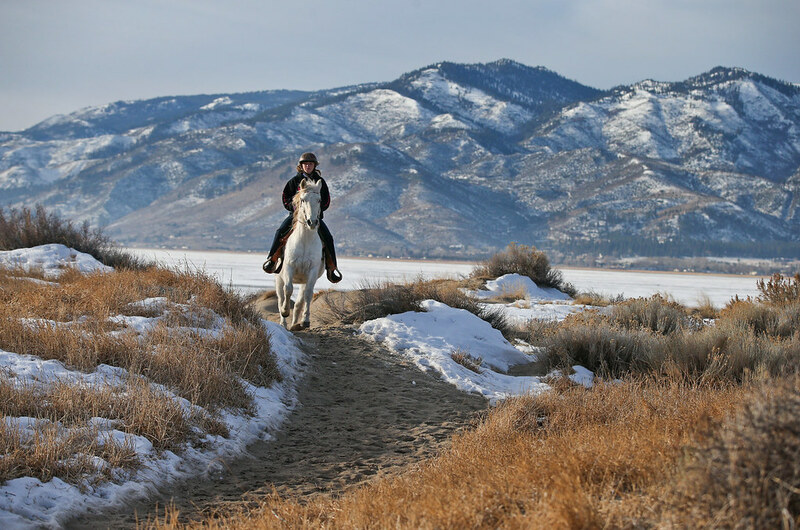 There are tons of options for horseback riding in Carson Valley. 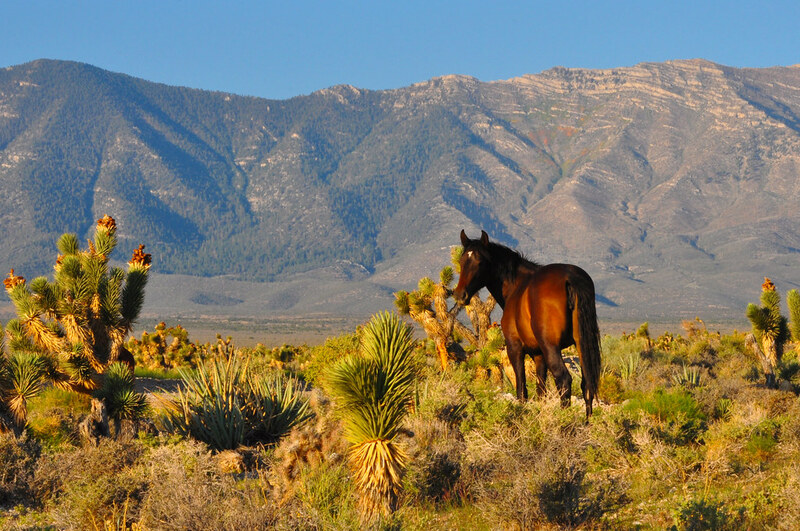 Don’t worry – you’re not riding the wild horses that also live in Carson Valley. Because they’re wild, and you are NOT an actual cowboy. 4. Take a Wildlife Photography Tour & See Nevada’s Wild Horses! Prefer to see horses from a distance – maybe through the lens of a camera? How about photographing not just wild horses, but raptors too – and maybe, if you’re lucky, a lynx … or a bear?! Wait, I thought this was supposed to be one of the “relaxing” outdoor activities… John T. Humphrey offers a wildlife tour that will get you up close and personal with wildlife – from a completely safe, eco-friendly and respectful distance, looking through your camera, that is. If you’re a birder, the Birding Under Nevada Skies tour is right up your alley. Again, there will be no riding of wild horses on this tour, or any other tours. This isn’t “how to become a cowboy for city slickers,” y’all. If mountain biking is a bit too intense, maybe a joyride in an ATV (all-terrain vehicle) or OHV (off-highway vehicle) is more your speed. Take a ride through one of the many ATV & OHV trails in Carson Valley and explore the high desert like you’ve never seen it before. Never driven an ATV before? Take a tour! Psst: keep an eye out for wild horses. Just don’t try to ride them! Remember: you are NOT a cowboy. There’s an incredible amount of fantastic hiking in Nevada, and Carson Valley is no different. The best hiking in Carson Valley covers the slopes of the eastern Sierras as well as the valley and high desert below them. You’ll be treated to everything from stunning mountain views to aspen groves to fir trees to alpine lakes high in the mountains above Carson Valley to sweeping vistas of the valley below. Here are just a few of the numerous options for hiking trails in Nevada near Carson Valley. This incredible hiking trail in Nevada (& California!) gets its own section, because it’s that epic. The entire 165-mile Tahoe Rim trail crosses six counties, four National Forests, three wilderness areas, two states and one state park. But you don’t have to go thru-hiking or even backpacking to enjoy this amazing hiking trail around beautiful Lake Tahoe. There are several day hikes along the Tahoe Rim trail right in Carson Valley, Nevada. Important: some sections are currently closed – please check this site for more information. The 12-mile section Spooner Summit to Kingsbury South hiking trail, studded with ancient fir trees and aspen groves, passes right through Genoa, with stunning views of Genoa Peak and of course, Lake Tahoe. Keep an eye out for wild marmots! The Kingsbury South to Star Lake section hike is a high-elevation hike beginning and ending at Heavenly Resort in Lake Tahoe. The trail leads to Star Lake, an alpine lake sitting at nearly 11,000 feet of elevation. You can also access Star Lake via this 11-mile trail beginning near South Lake Tahoe. Who can resist a high-speed water sport? Although, if we’re being totally honest, I’ve tried water skiing a handful of times and have never been able to actually stand up. So major kudos if you’re an Olympic athlete or Amazonian or whatever it takes to successfully water ski. You’ll find all kinds of water sports from wake boarding to tubing to jet skis and more at Topaz Lake. Topaz Lake is a stunning reservoir on the Nevada-California border, only 20 miles south of Gardnerville, Nevada and close to the eastern entrance of Yosemite National Park. Check out Topaz Lake boat rental and jet ski pricing. I feel like we’re missing a large body of water here … oh yeah, duh. Lake Tahoe is just 20 minutes away! 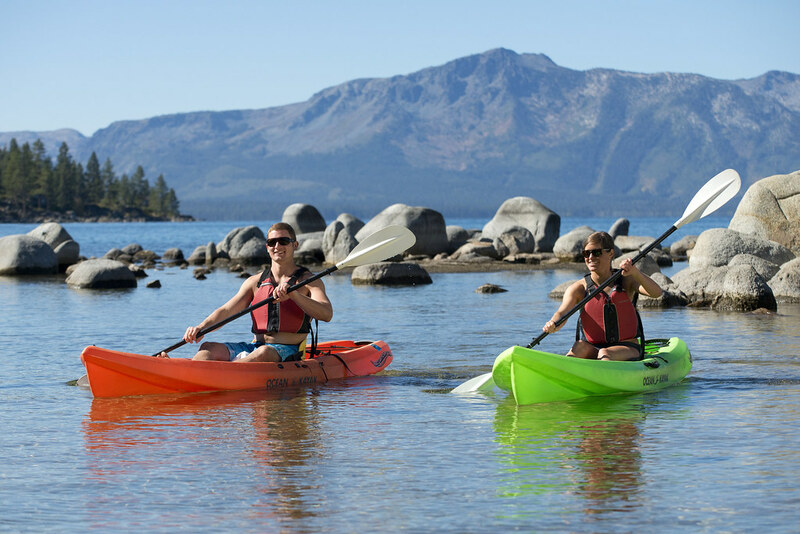 At Lake Tahoe you can kayak, stand-up paddleboard, or just relax on the beach and swim. Swimming and kayaking too tame for you? Hit the East Fork Carson River for a thrilling whitewater rafting adventure! Take in mountain views (quickly) as you hurtle past them in class II & III rapids on a half day, full day, or even 2 day ultra adventure! We both love white water rapids, as long as they’re class II or under (Lia) or class III and up (Jeremy). Hey, that one was a throwback reference to where Lia worked when she was a cast member at Disney World! Did you catch it, or did it go right over your head? I’ll wait. Carson Valley is actually known for its unique air pockets, which are real cool if you’re a nerdy pilot type (or just someone who’s into science and planes and geothermal dynamics or whatever, I guess). I’m not going to attempt to explain the science behind it, but suffice to say that you can ride the Sierra Wave like you’re an amazing sky surfer in a sailplane glider that flies without a motor. Again, magical science things. Come along for the ride or try your own hand at riding the wave! Head over to Soaring Nevada for information and pricing. I wanted to label this “Balloonin’ Over Nevada,” so you’re welcome for sparing you … this time. If you want to experience the unique thermal air pockets above Carson Valley but aren’t quite the adrenaline junkie type, a hot air balloon ride is the perfect way to experience the gorgeous views from above Carson Valley in an *ahem* calmer environment. They even give you mimosas afterwards to take the edge off. Now that’s Lia’s kind of tour! Get more information about Lake Tahoe Balloons or check prices here. Why just look at beautiful jagged mountaintops – either safely from the ground, or serenely from a hot air balloon as you float by – when you could instead fling yourself out of a plane and free-fall through the air towards them!? Lia can think of a few reasons, but don’t listen to her. We’ve actually skydived before, and I can tell you from my 1 and only experience (so my expert opinion, basically) that the better the view, the more enjoyable your skydive will be. So take in the entire Carson Valley and the Eastern Sierra mountain views and even giant Lake Tahoe from far above as you plunge towards the earth! Check out Skydive Lake Tahoe for pricing and more information. Carson Valley has just as much to offer in the winter for outdoor adventure lovers as it does in the summer. I mean, it is next to Lake Tahoe, after all. 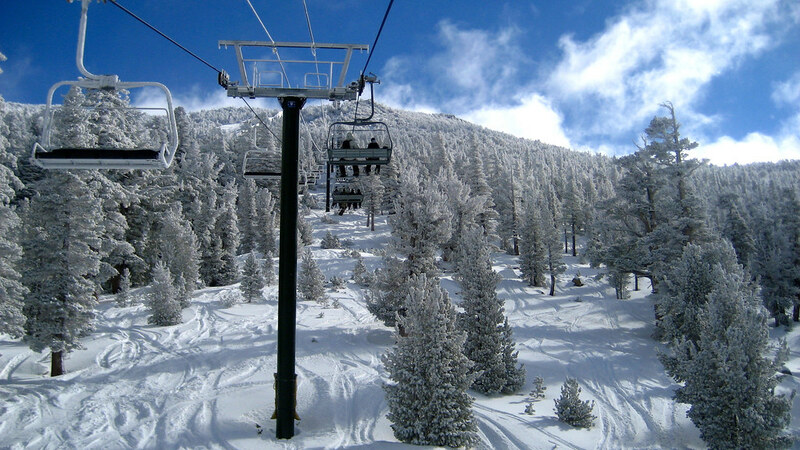 Only 20 minutes away from south Lake Tahoe, Carson Valley serves as the ideal base camp to Heavenly, Kirkwood and other Lake Tahoe winter sport destinations. Or if you’re not quite athletic/coordinated enough to actually do those things (like Lia, who has yet to succeed at actually standing up on a snowboard) how about a guided snowmobile tour? All of the winter fun, none of the physical exertion. Perfect. Looking for additional places in the region to go skiing? Check out this guide to the 4 best Salt Lake City ski resorts for a weekend getaway! Speaking of the best things to do on a snowy winter’s day, soaking in a steamy hot tub is at the top of Lia’s list (with like, a mug of hot chocolate. Yass)! Grover Hot Springs State Park isn’t the only place to enjoy the natural geothermal groundwater that creates the hot springs in Carson Valley, Nevada. You can also soak in hot springs at David Walley’s Hot Springs Resort & Spa. The resort is located in the town of Genoa, Nevada, and is surrounded with a 360˚ view of the majestic Eastern Sierra mountains. Soak in natural mineral spas while gazing at the stunning mountain views. Oh, and their pool is filled with naturally heated water. And they have eucalyptus steam rooms. Sign us up! There’s nothing like soaking in a hot spring after a long day of adventuring and exploring in Carson Valley! The Dangberg Home Ranch Historic Park is one of the best things to do in Minden, Nevada, one of the 3 towns comprising scenic and historic Carson Valley, Nevada. Now that we’ve convinced you to get your outdoorsy self and your favorite outdoorsy friends to Carson Valley, where should you stay while exploring all that the area has to offer? You could always stay in nearby Reno, Carson City, or South Lake Tahoe, but these 3 hidden gems are right in the heart of Carson Valley. They’re as much fun to explore as the mountains surrounding them! Don’t forget to download a copy of the Walking/Driving map of Carson Valley, which is chock full of interesting facts (like the story of Lucky Bill, the first man hanged in Nevada and winner of the Most Ironic Nickname award), history, and must-see stops in Carson Valley. Genoa, Nevada is considered the oldest permanent settlement in Nevada, established in 1851. The town is a living history museum … and is said to be the most haunted town in Nevada. Oooh, creepy! Try not to think about it as you soak in the hot springs at David Walley’s Resort Spa in Genoa (check prices). But definitely do dive into the ghost stories and take a historic ghost tour of Genoa! While you’re exploring historic Genoa, be sure to download the self-guided walking tour of Genoa. Oh, and if you happen to be visiting on the last weekend in September, you can’t miss the Genoa Candy Dance and craft fair! It’s one of the most famous things to do in Genoa. The Carson Valley Inn in Minden, Nevada is a great place to stay for exploring the Carson Valley (check prices). One of the best things to do in Minden is to visit the Dangberg Home Ranch Historic Park, a preserved historic ranch house that once housed the most prominent family in the area – the family that actually founded the town of Minden. You’ll learn about the history of Carson Valley! In a historical town like Gardnerville, Nevada, you have to stay at the Historian Inn (check prices). And speaking of history, here’s a little tidbit about Gardnerville: Spanish and French Basques (who Jeremy is actually descended from, fun fact!) played an important role in Northern Nevada and eastern California history, initially as sheepherders and later as inn and restaurant owners. Sampling Basque cuisine is one of the best things to do in Gardnerville. You’ll find plenty of Basque restaurants in Gardnerville, like J.T Basque Restaurant. Be sure to try the lamb – a Basque specialty – beef tongue stew, and the staple cocktail: a Picon Punch! Are you packing up your camping gear, lacing up your hiking boots, stuffing a Go-Pro in your Camelbak and scheduling a trip to Carson Valley, Nevada yet?! Are you more of an adrenaline junkie like Jeremy or a more relaxed outdoor adventurer like Lia? Which of these adventures would you try first? Drop us a comment below! Headed to Las Legas before or after your trip to Carson Valley? Check out some additional tours and day trips from Las Vegas for a bit of the outdoors! Psst: Are you itching to discover some natural scenery on an outdoorsy trip? Check out some of our other favorite hiking & outdoor adventure posts! Disclaimer: This post was sponsored by Visit Carson Valley. All opinions, bad jokes, and Brokeback Mountain references were entirely our own poor decisions and totally not their fault. Awww…man! Everything we did in California (and our short drive around the Nevada side of Lake Tahoe) went too fast and without the amount of time it deserved. It was basically a vast overview, but how I fell in love with the mountains! Being an East coast mountain girl, I have an affinity for mountains and I simply was astonished by the beautiful lakes and mountains on the west coast…esp. the Sierras! I really REALLY want to go back and spend a lot more time here. The camping sounds amazing. I’m a Midwest girl (or South? Kentucky is both, kinda) and I know what you mean! The west is GORGEOUS. The first time I saw Colorado and Utah and Nevada I was like did we get lost and end up in another country?! It’s just so beautiful out there! California is HUGE so you’ll definitely need to come back and explore again! Wow you have some pretty adventures things on this list! The hiking looks good to me. The area is so scenic. HORSIES!!!! I would cry like 12-yr-old me if I saw those wild horses. It’s a good thing I didn’t see this post before our road trip. We would have made a detour between Bishop, CA, and Tonopah, NV, and that would have added a day or two that we didn’t have. p.s. I <3 your EPIC posts! So much to do! So many people think Vegas is the only attraction in NV ~ but clearly that isn’t accurate. I *never* would’ve guessed that there would be white water rafting in that region… for some reason I had it in my head that it would be too flat — I looove rafting! Wow. I love the photos. It looks so stunning there. I would love to ride some horses or go white water rafting or hot air ballooning. I also love that it’s underrated because that means less tourists for me. Thanks for sharing, even though I may go bankrupt doing all these activities. LoL. Nevada looks so stunning ! 🙂 I would love to ride horses and to take a hot air balloon ride over the mountains….such a cool and fun experience. I will keep in mind few places and activities for my next trip in US. Wow! I grew up in Idaho and I had no idea that Nevada had so much to offer. You only really hear about Reno and Las Vegas! Next time in the area I’ll have to take some time and take advantage of your recommendations. And your photos are stunning! Love the fact that you can do a wild life photography tour – so cool! Thanks for all the info. Tahoe Rim Trail has been on my bucket list for years…I’ll be out that way in the fall, so I’ll definitely look back here for recommendations!